Vevo redesigns its interface for Apple TV | What Hi-Fi? 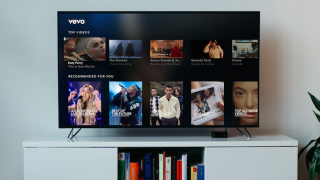 Vevo, the music-video app, has released a refreshed version of its app for the Apple TV, focusing on simpler navigation and greater scope for personalisation. New features of the update include a fresh design and layout, with artist stations based on mood, "time of day [...] big events and holidays" (similar to some of the curated playlists on Spotify or Tidal). You can also browse the app while listening to an artist or playlist, allowing you to preview what's inside a playlist before launching it. There's also a new genres section that allows you to access the app's top videos, trending artists and most recent playlists in a particular genre. The new Vevo app will be available from the 19th of May.